It is no secret that California is right at the top nationwide when it comes to taxes. The real tax rate when all taxes are combined, is well over 50%. Any money that the government receives is a tax. You can call it a fee, a fine, a surcharge or a license. It is a tax. The tax payers in California and Apple Valley have given and given and given. They have no more left to give. The middle class is broke. They have been squeezed dry. And yet, government keeps demanding more, always inventing new ways to get our money. The government is already given a budget by us, the taxpayers, but still, they take most of our money and give very little back. Sacramento, which is run by public employee unions, is daily passing new laws that harm California. Their agenda is simple: legalize illegals, raise taxes, rid California of small businesses, tell people what kind of bags to carry, put us all in electric cars and trains that go nowhere and make sure the public employee union’s every desire is catered to. What does all that have to do with Apple Valley? We should do everything we can in Apple Valley to protect our citizens from the abuses handed out daily by Sacramento. Put small business first, put the middle class first, put the taxpayer first, keep regulation to a minimum and have small and efficient government. 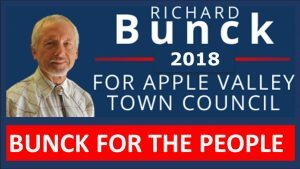 And, most of all, realize that it is not government that makes a good community, it is the good citizens of Apple Valley that make it a good community. If the town of Apple Valley bought Rancho Water Co, if it even could happen, could lead to even higher rates. Municipal utilities are not known for their low rates. The entities with lowest rates are consumer owned utility corporations, also known as “mutual utilities”. These exist in California. They have elective governing boards. The town government can help the rate payers, not by blocking, but rather by allowing creative solutions. There are a lot of smart people in Apple Valley. We need to enlist their talents to solve this issue. It can be solved if we have a “can-do”, not a “can’t-do” approach. Homelessness in Apple Valley is a growing problem. It needs to be recognized as a problem for Apple Valley, not ignored as if it will go away without being positively dealt with. Arresting the homeless for panhandling or vagrancy or attempting to coax them out of town is not a solution. I have found, by interviewing the homeless, that there are a variety of reasons for their homelessness. Some definitely have drug and alcohol issues. Others have been jobless, lost their housing, lost their car and ended up on the street. Some definitely have a variety of mental disorders. Obviously, some of the problems that the homeless have, require specialized help. But, when they are in our town, it is our problem. It affects us. Perhaps we should join with other cities to lobby the state to stop releasing mental patients without proper supervision and care. But, at the same time, lets not desensitize ourselves and ignore the problem of homelessness. It is only going to get worse. I would say that the town of Apple Valley should be innovative, leading the way on the homeless issue by coming up with a carefully crafted plan to start dealing with this growing problem. If nothing is done, it still costs the taxpayer indirectly with regards to policing, cleaning up after the homeless and tax revenue. Lets work together to deal with the problem and solve it in a way that benefits us all. The future of our town, our state and our nation, is our youth. As a contractor, I dealt with this first hand. Our youth aren’t taught any practical skills. To find a young man who knows how to measure, count, read and write is an exception. Our schools are failing in this regard. Education today is geared to have students pass the proficiency tests, instead of asking “Do they have practical skills to get a job and be competitive in the market place?”. How does the town factor into this problem? A lot of money is poured into soccer and baseball fields with expensive lighting. What about putting some of that money into a summer program to teach our youth practical skills. I would bet that there are skilled retired people in Apple Valley who would be happy to pass their knowledge on to motivated kids who are there because they want the skills and appreciate the opportunity to learn. Actually, much of a program of this type could be put together with private support. The town could could help by promoting, providing a building and generally expediting the effort. It would be a small effort for our youth.